Lying on the couch to enjoy your holiday movies but afraid of your beverage couldn't keep warm or cold until the movie ends, surf on the internet and immerse in the battles of gun fires, but your coke has become not hot or cool any more to stimulate you to have another kill, Now choose Homitt insulated tumbler, it holds an average day's supply of beverage, so you have a better life! Homitt stainless steel tumbler do not sweat no matter how cold the beverage is, so you won't get a wet hand or have a "water pool"on your table. what's more, the double wall vacuum exterior only keep the drink cool/warm, but not chill or burn your hand! This insulated tumbler mug makes a perfect gift either for yourself or anyone at Christmas, Birthdays, Valentines, Holidays, Anniversaries, Thanksgiving, or Mother's & Father's Day etc. This portable little utensil can be wrapped as a little box and looks quite exquisite. So why not choose Homitt Vacuum insulated tumbler as a gift to your friends or families? It sounds like a great idea that your beloved ones can use it every day to taste kinds of beverages, such as Whisky, Beers, Cocktail, Coke, Coffee, etc. It's perfect for teachers, RV campers, truck drivers, bus drivers, long-haul freight movers, And they can take this to BBQ rodeo cookoffs, sports events, tailgating, outdoor adventures, road trips, campfires, even office! 1. Be aware of the tumbler size, and make sure it meets your need. 2. Tests are done at normal temperature, conditions may vary according to different temperature. 3. Please tighten the lid securely so that the drink will be contained. COLD & WARM RETENTION - Double wall vacuum insulation for extreme temperature retention, this insulated tumbler can keep a tumbler of ice cake for 24H until the ice totally melt, or keep hot coffee warm for 6-8H, can be used in four seasons. So filled the tumbler with your favorite coffee, sweet tea, beer, ice water, milkshakes, lemonade, soda! DOUBLE WALL INSULATED DESIGN - Thanks to its double wall vacuum insulated design, the thermal tumbler never sweat, very Dry & Neat in hand, leave no water pool or get messed up with your table or hand. A full cup of nice warm, hot tea will never boil your hand. This travel mug tumbler is a great choice for home, office or travel! FOOD GRADE STAINLESS STEEL - Unlike those cheap tumblers, our stainless steel tumbler was made of food grade 304 stainless steel material, FDA approved, BPA free, reusable, unbreakable, never rust, don't retain smells and odors, it's a more healthier alternative to plastic, buy one and it will last you a lifetime! 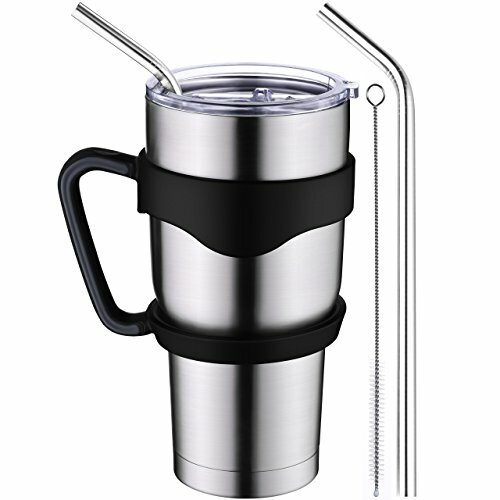 30 oz TUMBLER SET WITH EVERYTHING - Transparent slide lid and 2 stainless straws contribute to sipping on your drinks. Detachable handle for easy-carrying purpose. Clean the straw and tumbler with brush. Come with EVERYTHING, all components are very well-made, great budget at a single purchase than other named brand single mug at a higher price. PERFECT GIFT FOR ANYONE - Homitt stainless steel insulated tumbler set is a great gift choice for your families, friends, teacher, employee, etc. It is very thoughtful that the insulated mug will becomes others' daily mug. Every Homitt products enjoy 12 months warranty and 60 days money back guarantee. View More In Camping & Hiking. If you have any questions about this product by Homitt, contact us by completing and submitting the form below. If you are looking for a specif part number, please include it with your message.